Catholics are required to recite The Angelus, prayer, three times a day: 6:00 a.m., 12:00 p.m., & 6:00 p.m. Keep getting yourself and your loved ones prepared for the 3 Days of Darkness. 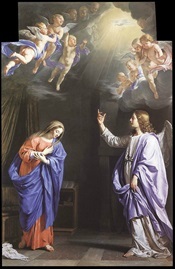 Be sure to see TCW's updated Catholic Images Gallery (with commentary). Sceptrum orthodoxae fidei (The Queen of the True Faith) ora pro nobis! Could you please send me the Ember Days fasting and abstinence guidelines? Reminder: Today, Sept 17 & Fri & Sat (19, 20) are Ember Days. Ember Days are four separate sets of three days within the same week. These days are set apart for special prayer and fasting. A Conference in Europe would be very great. we would be able to confess, receive Holy Communion, pray and discuss preparations. Today is the Feast Day of the Chair of St. Peter at Rome. Many thanks to those who have given special alms to Pope Gregory XVIII for this sacred day: especially Nick in Canada, Joergen in Denmark & Eduardo in Florida. Also thanks to Donald in PA, for your generosity towards Christ's True Vicar (in exile) during this time of sede impediti (i.e., our pope is being impeded by outside forces from publicly acting in His office). Where do I find this infallible teaching on Papal mandate? Pope Pius XII, authoritatively quashed the sophistic pleas by "traditionalist" priests that they must obey the “higher law” of providing Catholics with the Mass and Sacraments in his encyclical Ad Apostolorum Principis (June 29th, 1958). Being so isolated from each other, how can we lay people under Pope Gregory XVIII become better connected with each other, practically?